I will keep quiet on the fact that Caleb rewrote a bit of history when the shepherds and the wise men were doing battle. Eventually everyone took their proper places! Have a wonderful weekend and take a little time to reflect on this scene! Oh and did you notice it is snowing once again on the blog! Isn’t Playmobile just the best…I particularly like this set as it doesn’t have a gajillion little pieces…it was nice to take it out again and find everything! Yes…the wonders of boys and how they can erect an army out of just about anything! We are also doing a Jesse Tree this year and Caleb is really enjoying it as well. This wonderful was as always. Good talking with you tonight. Soren has this set too! I was just taking stuff out for decorating today (started Wed. night…little by little…), and noticed it. 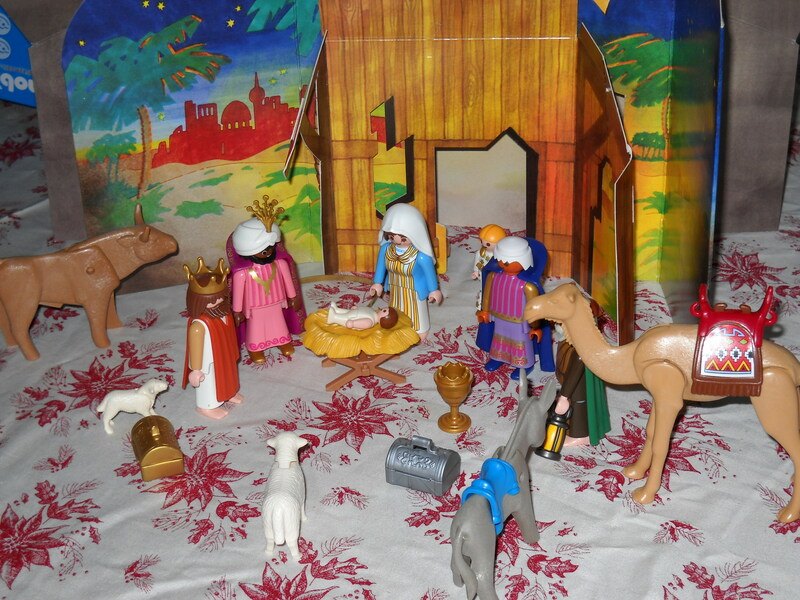 We put the wise men out on Ephiphany, as it’s also Russian Christmas in the Orthodox tradition! Love the battle thing though–BOYS.